What a three weeks it has been, particularly in bond markets where, ten years after the launch of QE, the prospect of deflation is priced as a clear and present danger! The good news is that we know what is coming next. The bad news is that we know what is coming next. The current war on deflation, a war lost if the shift in bond yields is to be believed, is bringing forth from the authorities not a new tactic but a whole new strategy - financial repression. So, is the financial repression, now renamed modern monetary theory/makeup strategy/nominal GDP targeting, imminent as bond yields in New Zealand and Australia reach all-time lows and the ten-year bond yields of both Japan and Germany return to zero? Considering monetary policy mom broadly, we are inviting thorough public scrutiny and are hoping to foster conversation regarding how the Fed can best exercise the precious monetary policy independence we have been granted. Our goal is to enhance the public's trust in the Federal Reserve - our most valuable asset. These direct quotes and other comments in Powell's speech in California on March 8th make it clear that the Fed's goal, above all others, is to protect its own independence. Like just about any other institution, it believes in self-preservation and can compromise on much to achieve it. It is no coincidence that the new strategic target has been put forward just as key political voices have raised the prospect of a move to Modem Monetary Theory - a capture of the Fed which is indeed red in tooth and claw. This threat to the institution, as much as the risk of an economic slowdown, can force the Fed proactively to change its strategic target. While The Solid Ground expects a deflationary bust to provide the main prompt for a central banking revolution, we cannot rule out that it is a political bust, at least as seen through the eyes of an independent central banker, that drives action. Many are to blame for the sudden outbreak in monetary theory madness, but the Fed must realize, at least in private, that their direct actions to boost asset prices have economically 'orphaned' many US citizens and created a political backlash. While their formal research may not recognise such a role, the point is that the citizens do and thus "it's all over now" for a monetary policy seen to benefit the few and not the many. Given the need to shift strategy, what the Fed is grabbing fast is the policy that will abate the citizens but preserve as much of its independence as possible. They thus are preparing to inflate away debts but are looking for "widespread societal understanding and acceptance" before doing so. The speech refers to a series of 'town-hall' meetings that the Fed will run across the country in search of such acceptance. Should a recession/credit crunch come along before that exercise in democracy is completed such 'acceptance' may just have to be inferred. Investors must be in no doubt that this is not more QE. It is a strategic shift in monetary policy aimed at benefiting debtors at the expense of creditors, and spenders at the expense of savers. As discussed in that last newsletter, a few weeks ago, what investors need to grab fast now is gold, even as the markets price in ever clearer risks of deflation. In those past few weeks bond yields have shifted markedly lower and the gold price markedly higher. That's a terrible combination that suggests that it is indeed all over now, at least for those who believe that markets are ultimately better at allocating resources than governments. 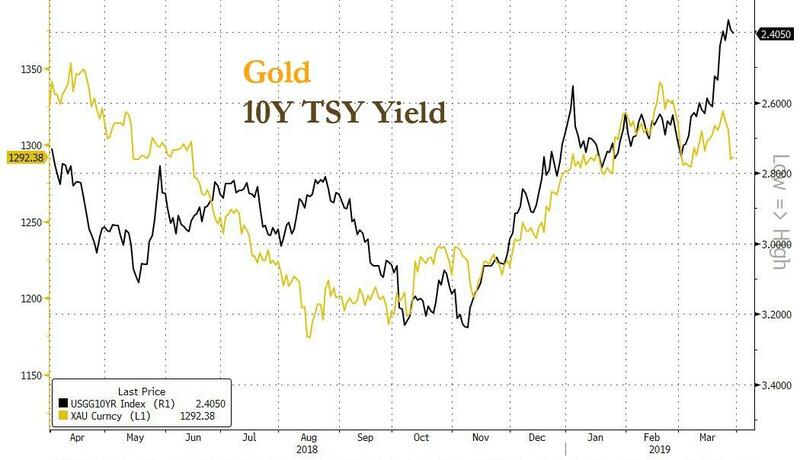 If bond market moves do indeed augur another deflationary scare and a move to a new monetary strategy of financial repression, then gold is just beginning what could be a thirty-year bull market. Sometimes it's the cure and not the disease that ultimately kills you. So it is to be for savers/investors when it comes to the cure that has constantly cheered their chilled hearts since 2009. That cure, in the form of larger central bank balance sheets, was explicitly aimed at producing a positive wealth effect by boosting asset prices and encouraging consumption. It succeeded, at least it did for those who owned assets, and the FT 'How to Spend It' supplement beam testimony to the link between the rise in asset prices and a type of rise in consumption. Of course, that illustration of the gap between the 'have nots' and the 'have yachts' has created its own form of threat to savers, and now a new monetary policy is mooted which will shift wealth from the owners of assets, in particular credit assets, to wage earners and the leveraged. 'They that sow the wind shall reap the whirlwind' and the tactical victory for the owners of assets in the age of QE (2009¬2019) will unleash a whirlwind, in the form of financial repression, which will deplete the purchasing power of savings mightily over the forthcoming years. So much for the long-term political failure of QE, but what about its short-term failure: it's creation of a deflationary bust! For many years The Solid Ground has argued that QE was producing debt faster than it was producing money and thus was setting the stage for our next deflationary bust. The balance sheet deterioration that resulted from bringing forward growth via the accumulation of debt has troubled investors occasionally over the past decade. It did so in the Eurozone crisis, particularly regarding the debt levels for the so-called PIIGS (Portugal, Ireland, Italy, Greece and Spain), it did so for the so-called 'taper tantrum' for emerging markets, it did so when Glencore and other commodity producers were in trouble in early 2016 and it did so yet again when Turkey seemed incapable of servicing its huge foreign currency debt obligations. The monetary medicine called QE was liberally dosed out but despite this European equity prices, emerging market equity prices, and commodity prices are all lower than they were in 2014. Debt, however, is much higher. For most investors more monetary medicine still means more profits but increasingly this has relied upon an inflation of US equity prices- now 58% of the Morgan Stanley All Country World Index. So here we are again, central bankers are preparing more medicine and investors await their bounty despite the fact that the last dose had limited impacts - at least outside the US. It is legitimate for investors to believe that a major deflationary shock will either not be permitted or at least reversed quickly by the action of the authorities. Indeed, in Anatomy of The Bear Lessons From Wall Street's Four Great Bottoms (Harriman House Limited 2016) your analyst argues that it is this social panic to defeat deflation that signals the end of a bear market. However, in those four great bottoms equity valuations were extremely low and none of them coincided with debt-to-GDP ratios at the current excessive levels. Society has thus not yet had to face the true consequences of too much debt and thus not had to adapt the extreme policies necessary to inflate those debts away. Indeed, behaviour across the planet shows that the lessons they have learned from central bank actions is that they can only benefit from having even more debt. For those who thought that QE was that extreme policy and it wasn't too bad, then the rise of the global debt-to-GDP ratio and the recent dive in bond yields indicates that they have simply not been extreme enough or perhaps just extremely misconceived. There is no doubt that the assembled authorities cannot contemplate the consequences now of even less money, given the record high levels of debt to GDP. The Solid Ground has long argued that their inability to accept the social consequences of the gravity of financial market value will indeed lead them not to try to use their balance sheets to influence pricing, but ultimately to use their legal authority to suspend and set pricing - financial repression. When that comes all sorts of phoney prices can be created, albeit at an extremely high price for savers and also the efficient allocation of capital. As Jay Powell made it clear in his speech at Stanford in March there would have to be 'widespread societal understanding and acceptance' for such a move. Your analyst continues to believe that it will be dramatically lower prices for equities, associated with a recession and probably deflation that will be taken as sufficient pain to imply such 'understanding and acceptance.' The recent dive in bond yields indicates that such pain is imminent. In Capital Management In The Age of Financial Repression 3Q 2016, The Solid Ground shows, using historical examples, the Alice in Wonderland world that ensues for savers when acceptance grows that debts MUST be inflated away. Its a world where our political masters, fearful of the consequences from their own policy mistakes, subject us to a suspension of pricing for our own benefit. Be in no doubt that the continued dive in bond yields and the likely dive in equities, should the bond investors view on the growth deterioration be confirmed, paves the way for the new era of financial repression, perhaps tongue in cheek to be known this time as 'capitalism with Chinese characteristics'. So is there any good news for investors? Yes, there is. We can all retrain as investors who understand the nature and consequences of financial repression with some study of the history of financial repression. Algorithms, however, laboring with only post-repression data, will still be merrily investing funds to take advantage of the less government and more market and general disinflation that they have the past forty years of data to describe - oops! Financial repression will be triggered by a deflationary episode and investors must now prepare for that episode. However, when we move to financial repression asset allocation becomes very easy by ignoring bonds, buying gold and buying equities with high fixed costs, usually companies that are asset heavy and not asset light. These are not unconventional assets, but the secret will be to hold them in unconventional amounts. Of course, the most important thing to do in any repression is to move your savings to a country that will not need to repress them - a country with a low debt-to-GDP ratio. Having taken such unconventional measures, your job is largely done because it should outperlom with little or no further active management for a few decades. Note your 2019 asset weightings and be prepared to liquidate, but only when the algorithms have reached the same weightings. I'd guess for these 'vagabonds' that will be about 2039! Active managers get to 'strike another match' whenever they want — well at least those free to move to unconventional asset sizing and leave the age of stepping stones behind.